SACRAMENTO, Calif. /California Newswire/ — Today would have marked the 78th birthday of John Lennon, and his legacy is still helping to “Imagine there’s no hunger,” in California, Florida and throughout the United States. Yoko Ono Lennon has kindly authorized the use of the iconic self-portrait image to help the California Association of Food Banks and Feeding Florida in their ongoing fight to end hunger. The John Lennon iconic self-portrait image provides a powerful symbol of his humanitarian legacy, raising awareness to the need to address hunger and providing an image that will promote significant funding to help end hunger in America. With the newly restored “Imagine” movie and box set, a whole new generation of Lennon fans are also emerging. 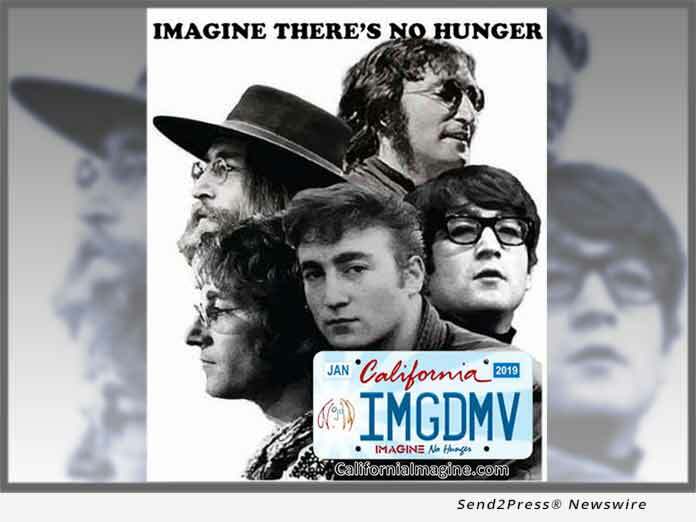 The “Imagine No Hunger” license plate is available for pre-order at https://californiaimagine.com/. 7,500 have to be pre-purchased before the California DMV will proceed with creating the plate for availability to all California drivers. Each year, the member food banks of Feeding Florida provide food to the 3.3 million Floridians facing hunger, including 1.1 million children and 700,000 seniors. Every day in California, nearly 1 in 8 households face food insecurity. For the 6.5 million Californians struggling with food insecurity, hard choices must be made between buying food and meeting such basic needs as housing, medicine, transportation, or childcare. It is estimated that hunger in California could be eliminated with an investment of $300-500 million dollars annually. If 10 million California drivers purchased the “Imagine No Hunger” specialty plate – hunger would be eliminated from the state. “These Imagine license plates will bring vital awareness to a critical problem in our state,” says Michael Flood, President and CEO of the Los Angeles Regional Food Bank (https://www.lafoodbank.org/). Visit CaliforniaImagine.com to pre-order the Imagine No Hunger license plate and help end hunger in California. Visit ImagineFeedingFlorida.com to order the Imagine specialty license plate and help end hunger in Florida.